No-Prep 5th Grade STAAR math data, table and graphs practice with 30 enrichment projects and 30 test-prep problem solving problems directly aligned to the 5th grade TEKS. 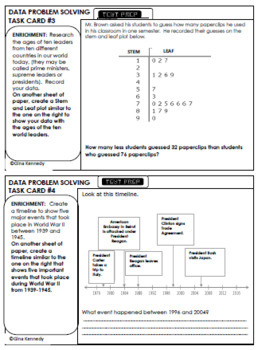 A great way to teach the data standards in a fun, engaging way. Great for early finishers, advanced learners or whole class practice. 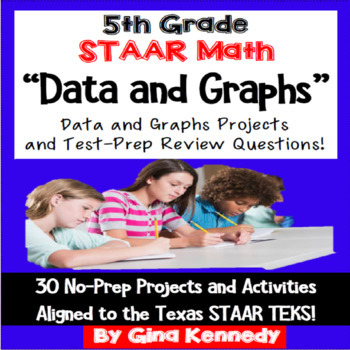 This resource includes thirty 5th Grade STAAR data and graphs problem solving test-prep questions and 30 no-prep data and graphs enrichment projects. NEVER WORRY ABOUT CHALLENGING YOUR STUDENTS AGAIN! Perfect authentic enrichment for advanced learners and early finishers, or great whole class "Friday Fun" math projects! The projects are completely teacher friendly. Many of the enrichment projects will provide an excellent way to integrate math and technology. Your students will be able to find the information and make their calculations completely independently. Most projects can be completed independently with nothing more than a paper, pencil and possibly a ruler. 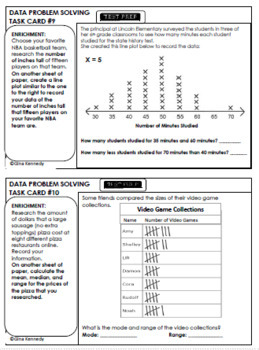 The task cards will provide a valuable resource for your classroom as an authentic data and graphs problem solving assessment to check for understanding of this important math concept as well as add depth to promote understanding of the new rigorous standards covered in this resource. 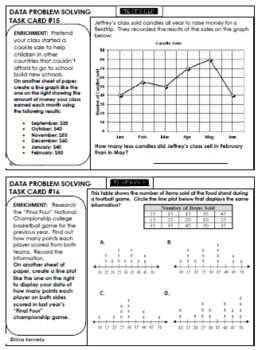 This resource will also prove to be a valuable tool to to provide real-life applications to use data and graphs in everyday problem solving skills. Great for individuals, groups or whole class fun! 5th Grade Math STAAR Reproducible Journal Prompt Activities for ALL MATH TEKS! 5th Grade STAAR Test-Prep, Centers and More!